Kathleen's Chloe Ellefson adult mystery, A Memory of Muskets, has now been ranked in the Top 1% of all US Print Book Sales—out of over 8 million books tracked—for a running total of one hundred fifty days. Source: Nielsen BookScan. Kathleen is heading off today to work on the Chloe 9 manuscript (for fall 2018 release) at an undisclosed location. She will be out of comm until December 16th. Mr. Ernst and Ms Sophie will be at home, keeping the office open. The lucky winners of Kathleen's Six Books for Six Readers Giveaway are Bethany Davis, Deborah Schindler Dingledy, Stephanie Romig, Rosanne Tucker-Gilliam, Michelle Vechinsky, and Madelon Willard. Each will receive a complete set of six signed, personalized, hardcover, first-release Caroline American Girl books. Congratulations! Kathleen's latest newsletter is out today, subject line Giveaway, Getaway, Gratitude. Get the details, including her answer to "Of all your books, which is your favorite?" Discover it all by clicking HERE. 6 Caroline Books for 6 Readers Giveaway! Kathleen is giving away a complete set of six signed, hardcover, first-release Caroline American Girl books to each of six lucky winners! To enter, leave a comment to the Giveaway post on Kathleen's Facebook Author page or Sites & Stories Blog page. Deadline to enter is Midnight, US Central time, Thursday, November 30, 2017. Six winners will be chosen at random and announced here and on those pages. Good luck! The eighth and newest novel in the award-winning Chloe Ellefson mystery series has now been ranked in the Top 1% of all US Print Book Sales—out of over 8M books tracked—for a running total of 100 days pre- and post-release. (Data source: Nielsen BookScan). This is the earliest that any Chloe mystery has ever reached the century milestone. Like so many this Thanksgiving, Kathleen hit the road to visit and celebrate with family. During the long drive there and back with Mr. Ernst she spent part of the time writing her upcoming Holiday newsletter and editing the next Chloe Ellefson mystery manuscript (book #9 due out fall 2018). Deadlines, deadlines! Describing the story as "captivating" and "lovely", a review of Kathleen's newest Chloe Ellefson mystery, Mining For Justice, is now on the Mystery Scene Magazine website. Robin Agnew's review was originally published in the magazine's Fall 2017 print issue. Read the complete review by clicking HERE. It was a chilly night, but Kathleen got a warm response to her Chloe Ellefson Mysteries program from a room full of history buffs at the Mining and Rollo Jamison Museums in Platteville, WI. Thanks to everyone who attended! Kathleen will be back in the Driftless Region on March 13th to do her Chloe Ellefson and American Girl Fans programs at the public library in Darlington, WI. A wonderful group of new and long-time Chloe readers attended Kathleen's hour-long Chloe Ellefson mysteries program last night at the Middleton WI Public Library. Thanks to all who came out on a cold night! Thanks also to the library's Friends group, whose support enabled Kathleen's presentation to be open to the public without charge. Kathleen sent this snapshot of her muse, Sophie, helping her work on the next Chloe Ellefson mystery during their week-long writing retreat. The Chloe 9 manuscript, to be published fall 2018, is on Kat's laptop, just off screen on the right. As you can see, Sophie is seeking a new perspective on Kathleen's work-in-progress. This photo was taken as Kathleen and Sophie her feline super-muse departed today for their week-long writing retreat. They'll be working on the manuscript for what will be the ninth Chloe Ellefson mystery, due out fall 2018. Fly fingers, fly, Kathleen! Kathleen and Sophie the feline super-muse leave tomorrow for an undisclosed location. While there, they'll be working on the manuscript of her ninth Chloe Ellefson mystery, slated for release in fall 2018. Kathleen will be offline until Tuesday, November 7th. Inquiries can be directed to Mr. Ernst, who will be home keeping the office open. In her non-fiction history book, A Settler's Year, Kathleen shared a story about Swiss immigrants who were each given an apple when they became US citizens. The tables at Kathleen's Wisconsin Pioneers program at the Chippewa Valley Museum were adorned with heirloom apples, autumn leaves, kitchen artifacts, and a copy of the anecdote. The sold out crowd was as delightful as the displays were clever! 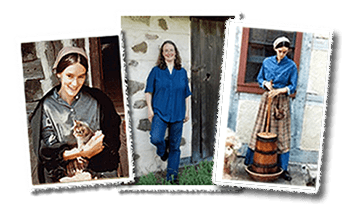 The second of Kathleen's two events at the festival is a richly illustrated program based on her non-fiction book A Settler's Year: Pioneer Life Through The Seasons. Her presentation takes place at the festival luncheon on Wednesday, October 25th, at the Chippewa Valley Museum. Afterwards Kathleen will answer questions and sign books (copies will be available for purchase). NOTE: Kathleen's luncheon program has sold out. Kathleen's Chloe Ellefson mysteries program for the Chippewa Valley Book Festival was held tonight at the Fall Creek WI Public Library. Despite the cold night (frost predicted), a crowd of some 40+ readers gave Kathleen a warm welcome. Great fun! Kathleen reports she had "a terrific evening" with the wonderful crowd of new and long-time Chloe Ellefson readers who attended her talk at Books & Company bookstore in Oconomowoc and purchased signed copies of her just released 8th Chloe mystery book, Mining For Justice. This afternoon a stream of eager fans greeted Kathleen at Old World Wisconsin—despite the rain—to get signed copies of her newest Chloe Ellefson mystery, Mining For Justice. Chloe fans are the greatest! Kathleen is in Chicago for this annual gathering of Midwest independent booksellers. From 1 PM (until copies run out) she'll be signing her just released 8th Chloe Ellefson mystery, Mining For Justice, at the Midnight Ink table. Sorry Chicagoland Chloe fans, this trade show is not open to the public. In the afternoon it was a roomful of American Girl fans who love reading and writing. That evening it was adults who enjoy Wisconsin-based Chloe Ellefson mysteries. Kathleen had a wonderful time at the Ruth Culver Community Library, thanks to both groups—and the library staff and Friends members who made it all possible. Kindle as well as NOOK and other EPUB3 versions of Mining For Justice, Kathleen's 8th Chloe Ellefson mystery, will be available for download starting this Sunday, October 8th. To see a partial list of vendors offering this story as an ebook, click HERE. A capacity crowd filled the Pendarvis Historic Site Education Center behind the 1850s Martin log cabin (left) for Kathleen's Chloe Ellefson Mining For Justice program on the final day of Mineral Point's 25th annual Cornish Fest. Afterwards attendees were treated to the surprise reveal of a secret hidey hole (that even many local residents had never seen) that is featured in the mystery. The 1862 Walker House in Mineral Point invited Kathleen to sign copies of her just released Chloe Ellefson mystery, Mining For Justice, during their Saturday night Cornish Fest Pasty Dinner, which over 200 people attended. A little known fact: Kathleen wrote substantial sections of the book, including a scene set there, during several extended writing retreats at The Walker House. Chloe 8 - Now Shipping! Last night a wonderful crowd of avid Chloe Ellefson fans came to hear Kathleen tell some of the 'stories behind the story' of Mining For Justice, ask questions about the book and the series—and get signed, personalized copies. Chloe and Roelke fans, and the folks at Mystery To Me books, are the best! "We Couldn't Put It Down"
Today Kathleen appeared on The Larry Meiller Show to discuss Mining For Justice, the brand new eighth book in her popular Chloe Ellefson mystery series. You can listen to a recording of the interview by clicking HERE. Kathleen will be on The Larry Meiller Show from 11:45 AM to 12:30 PM this Thursday, September 28th, talking about her newest Chloe Ellefson mystery, Mining For Justice. You can hear them live on the Wisconsin Public Radio IDEAS radio network or listen to them from anywhere, streaming over the internet from the WPR website. Kathleen's Fall 2017 newsletter went out today, chock full of news about the launch of Mining For Justice, the eighth Chloe Ellefson mystery—and more! Read it by clicking HERE. Here's a quote from a recently released review of Mining For Justice. If you enjoyed Jim Fleming's abridged version of Kathleen's A Memory of Muskets, please let him know. Perhaps someday he might broadcast another Chloe mystery! This Monday the Wisconsin Public Radio Chapter A Day program begins broadcasting the fourth and final week of its' abridged version of the Chloe Ellefson mystery, A Memory of Muskets. Hear host Jim Fleming's half-hour readings weekdays midday at 12:30 PM (repeated at 11 PM) on the WPR IDEAS Network and streaming from the WPR website. If you miss any of the 20 episodes, each can be heard on the WPR Archives for one week after its broadcast. The plot of the second Chloe Ellefson mystery, The Heirloom Murders, includes details about the legendary Eagle Diamond. This real, 16 carat gemstone was stolen during a high-profile crime in 1964—and never recovered. To read, print, or download a detailed article about it by Mara Kent, in the Wisconsin Historical Society magazine, click HERE. This Monday Wisconsin Public Radio's Chapter A Day program starts broadcasting week three its' abridged version of the Chloe Ellefson mystery, A Memory of Muskets. Hear host Jim Fleming's half-hour readings weekdays midday at 12:30 PM (repeated at 11 PM) on the WPR IDEAS Network and streaming from the WPR website. If you miss any of the 20 episodes, each can be heard on the WPR Archives for a week after its broadcast. Yesterday Kathleen spent the afternoon and evening in Viroqua, Wisconsin, talking with readers of her twenty American Girl and soon-to-be right Chloe Ellefson books. Her visit was sponsored by the county's public libraries as part of their Vernon County Reads! program. Kathleen had "a fantastic time" with the many "lovely readers" who attended. Kathleen will be away presenting her American Girl Fans program from 3-4 PM and her Chloe Ellefson Mysteries program from 7-8 PM, this Thursday, August 17th. NOTE: these programs will now be held at the Viroqua Middle School/High School Commons, 100 Blackhawk Avenue, in Viroqua. Both are free and open to the public, thanks to the Vernon County libraries. This Monday Wisconsin Public Radio's Chapter A Day program starts broadcasting week two of its' abridged version of the Chloe Ellefson mystery, A Memory of Muskets. Hear host Jim Fleming's half-hour readings weekdays midday at 12:30 PM (repeated at 11 PM) on the WPR IDEAS Network and streaming from the WPR website. If you miss any of the 20 episodes, each can be heard on the WPR Archives for a week after its broadcast. Episodes 1-5 of Jim Fleming's delightful abridged version of Kathleen's adult mystery book, A Memory of Muskets, have now aired on Wisconsin Public Radio's Chapter A Day program. If you haven't yet heard them, there's still time. Episodes can be streamed over the internet from the WPR CAD Archives for one week after each has aired. Act now! Kathleen's seventh Chloe Ellefson mystery, A Memory of Muskets, has now been ranked in the Top 1% of all US Print Book Sales—out of over 8 million books tracked—for a running total of one hundred twenty-five days. Source: Nielsen BookScan. The Vernon County Public Libraries have been holding a summer program called “Vernon County Reads”—and Kathleen is its' 2017 honored author. On August 17th she will present her popular American Girl Fans and Chloe Ellefson Mysteries programs, at 3 PM and 7 PM respectively, in the Viroqua Elementary School Cafetorium, 115 North Education Ave., Viroqua, WI. Both one-hour programs are free and open to the public. Wisconsin Public Radio's Chapter A Day program begins broadcasting an abridged version of Kathleen's Chloe Ellefson mystery, A Memory of Muskets, today. You can hear host Jim Fleming's half-hour readings weekdays midday at 12:30 PM (repeated at 11 PM) on the WPR IDEAS Network and streaming from the CAD website. If you miss any of the 20 episodes, each can be heard on the WPR Archives for a week after its broadcast. Chapter A Day - What's That? Glad you asked! It so happens Kathleen just posted an article about Chapter A Day on her blog. Did you know that CAD is one of the very longest running radio programs in America—having first aired in 1931! Read why host Jim Fleming selected A Memory of Muskets, and what it takes him to prepare an abridged version for broadcast, click HERE. 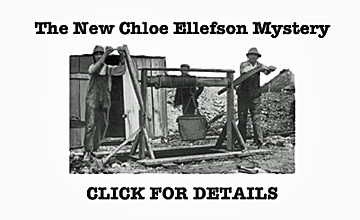 Host Jim Fleming of Wisconsin Public Radio's Chapter A Day program has created an abridged version of Kathleen's Chloe Ellefson mystery, A Memory of Muskets, which he begins reading this Monday, August 7th. Listen below to Jim's narrating the opening lines. Want to read Mining For Justice before it officially ships this October? Post a comment on Kathleen's Facebook Author Page or her blog before Midnight, Thursday, August 3rd. Eight lucky winners will each receive their very own signed ARC of the 8th Chloe Ellefson mystery! Their names will be posted the next day—here and on those pages. This small town music festival celebrates Swiss Independence Day and the area's Swiss heritage. It's this Sunday, August 6th, from 1-3:30 PM at the Tell Shooting Park just north of the lovely town of New Glarus, WI. Kathleen attended Volksfest while researching her Swiss-themed second Chloe Ellefson mystery book—The Heirloom Murders—and loved it. Wahoo NE Public Library - Pam Lindholm. Kathleen is giving away three sets of her Chloe Ellefson audiobooks, one set each to three deserving public libraries! You can nominate your favorite library by leaving a comment on her Sites And Stories blog or Facebook Author page prior to midnight, Wednesday, July 26th. The three winning libraries will be announced July 27th. Enter now! 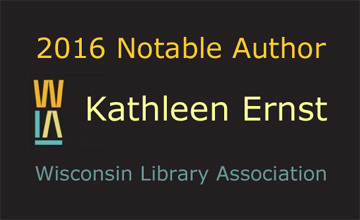 Wisconsin Public Radio's popular Chapter A Day program has selected Kathleen's newest Chloe Ellefson mystery, A Memory of Muskets, for serialization. Host Jim Fleming has created a special abridged version—which you can hear him reading on air and over the internet for four weeks starting August 7th. CAD has an audience of some 300,000 listeners and is WPR's longest-running program, having started in 1931. Stay tuned for details. Kathleen is away this week at an undisclosed location, working on the manuscript for her ninth Chloe Ellefson mystery book. She is under contract to deliver this as-yet-untitled work for publication in 2018 (not to be confused with Chloe 8, Mining For Justice, which is set for release this October 8th). Mr. Ernst and Sophie the feline Super Muse are staying behind to keep the home office humming. Chloe 8 - Off to the Printer! The American Girl Felicity character is the subject of an article in the Summer 2017 issue of Trend & Tradition, the magazine of the Colonial Williamsburg historic site in Virginia. Felicity's stories, including Kathleen's newest book, Gunpowder and Tea Cakes: My Adventure With Felicity, are set at Williamsburg during the American Revolution. Kathleen was interviewed for the article earlier this year. Americans are said to be divided about many things, but we should all be able to celebrate today—the 241st anniversary of the United States Declaration of Independence—when in 1776 the thirteen American colonies declared themselves to be a new country, and no longer part of the British Empire. Today let us honor those who signed the Declaration, and all who suffered, fought, and died during the 8 year war to secure our independence. Kathleen just left on a 4-day research trip—digging into historical records and interviewing subject matter experts—for the 9th Chloe Ellefson book, due out in 2018. (Not to be confused with Chloe 8, Mining For Justice, which is set for release this October 8th.) Sophie the Feline Super Muse and Mr. Ernst remain behind, keeping the home office open. From the June 22, 2017 La Crosse Tribune: "Our summer 2017 “Vernon County Reads” author, Kathleen Ernst, used Vesterheim as the inspiration for her book, “Heritage of Darkness.” Vesterheim plans to mold our tour around the plot of this mystery novel, featuring amateur sleuth Chloe Ellefson’s adventures at the museum." For more details about the tour—which is open to the general public—and how to register, click HERE. Kathleen's latest newsletter went out today, chock full of news of the current and upcoming Chloe Ellefson mysteries, plus suggestions for Summer Getaways. Read it by clicking HERE. Kathleen just received a 2016 All Star Award for email effectiveness from Constant Contact, which provides email marketing serves to some 5,000,000 small businesses and non-profits. This is the fifth consecutive year Kathleen has earned this honor. Less than six percent of Constant Contact customers are multi-year All Star Award recipients. Kathleen's eighth Chloe Ellefson mystery, Mining For Justice, arrives early this October, and pre-orders for it have already exceeded those of any of the previous seven Chloe books. Yesterday on the Amazon.com MFJ page it said that customers who bought it also ordered the next books by Sue Grafton, William Kent Krueger, and Louise Penny. The unabridged audiobook of The Light Keeper's Legacy is now available as a download or as Audio and MP3 CD sets. To see a list of vendors providing these formats, click HERE. Listen to a short sample below. Kathleen and Sophie are back from their week-long writing retreat, reporting that they made good progress on Chloe 9. Kathleen says having a block of quiet time is incredibly helpful when she is still figuring out the story. Sophie adds that it also helps to have a talented feline ghostwriter! What we now know as Memorial Day was begun in 1866 by women in Columbus, Mississippi, who laid flowers on the graves of Civil War soldiers (both Confederate and Union) buried in the local cemetery. The custom spread throughout the Southern states, and was adopted (some say co-opted) by veterans of the Northern Army. Now the day is dedicated to remembering all of America's military veterans. The unabridged audiobook of the second Chloe Ellefson mystery, The Heirloom Murders, is now shipping! Listen below to a 3 minute 30 second sample. In Norway, Syttende Mai (May 17), is celebrated as Constitution Day and as Children's Day. On this day in 1814 Norway adopted its Constitution, which led in time to its independence. In 1870 Norwegian school children began celebrating the day by marching to the Royal Palace in Oslo where, for over 100 years, the Royal family has reviewed the parade. After two weeks away on her 'Family, Friends, and Sharpsburg' road trip, Kathleen is safely back home. Mr. Ernst and Sophie the Feline Super Muse rejoice! All is as it should be, again. Kathleen is back among friends on familiar ground, the historic town of Sharpsburg, MD. Decades ago she spent considerable time there researching her non-fiction American Civil War history book: Too Afraid to Cry: Maryland Civilians in the Antietam Campaign. Yesterday she did a school program, then spent the evening at the public library talking about her book. She says it was wonderful reconnecting with so many dear friends. Kathleen's away for the next two weeks, visiting family 'Out East' and doing a program at Sharpsburg, Maryland (for details see her Calendar). 'Mr. Ernst' and Sophie the Feline Super Muse are remaining behind, keeping the home office humming. Drive safe, Kathleen! Saturday is Independent Bookstore Day! Kathleen's latest newsletter went out today, with news that the first of three Chloe Ellefson audiobooks is now shipping, plus an article about the American Girl Felicity Generation, suggestions for Summer Getaways—and more. Read it by clicking HERE. The unabridged audiobook of the first Chloe Ellefson mystery, Old World Murder, is now shipping! Listen below to the 3-minute scene in which Chloe and Roelke first meet. Kathleen's next Chloe Ellefson mystery, Mining for Justice, has been ranked in the Top 1% of all US Print Book Sales—out of over 8 million books tracked—based on pre-orders (source: Nielsen BookScan). The story is set for release in trade paperback and ebook formats on October 8, 2017. To pre-order now, Click HERE. What a delightful way to spend a Saturday. At 1 PM Kathleen gave her American Girl Fans program at a tea party sponsored by the Oregon Public Library. Nothing like a room full of girls, their dolls, and adult caregivers—all excited about reading and writing—to bring joy to an author's heart! And at 3 PM Kathleen was rewarded by an avid group of adult readers—including many Roelke fans—who attended her Chloe Ellefson mysteries program. An unabridged audiobook of the first Chloe Ellefson mystery, Old World Murder, comes out April 25th. Listen below to the 3-minute scene in which Chloe and Roelke first meet. Kathleen's next Chloe Ellefson mystery, Mining for Justice, has been ranked in the Top 1% of all US Print Book Sales—out of over 8 million books tracked—for a running total of fifthteen days since it became available for pre-order. Source: Nielsen BookScan. Kathleen received a warm Norwegian-American welcome Tuesday night in Green Bay, WI. She was there to present a special 'All Things Norske' Chloe Ellefson mysteries program to the Sons of Norway lodge. In the course of the evening Kathleen was treated to a wonderful dinner, given a lovely bouquet of flowers, and offered a plate of delightful treats. The Green Bay Lodge sure knows how to fete an author! This Tuesday, April 21st, Kathleen will be giving the special 'All Things Norwegian-American' version of her Chloe Ellefson mysteries program for the SON Lodge 632 in Green Bay, WI. The program begins at 6:30 PM in the Trinity Lutheran Church at 330 South Broadway, and is free and open to the public. Kathleen's multiple award-winning American Girl historical fiction 'History Mystery' book, Betrayal at Cross Creek, has just been ranked in the Top 1% of all US Print Book Sales—out of over 8 million books tracked— for three days running (source: Nielsen BookScan). This tale of Scottish immigrants in the American Revolution was released thirteen years ago! Kathleen is away today visiting the Wisconsin Village of Eagle Police Department. Readers of her popular Chloe Ellefson mystery series are well acquainted with the EPD, including Officer Roelke McKenna. Perhaps less known is the key role the real life EPD officers have generously played—from the first book forward—in helping her accurately portray the fictional EPD and the law enforcement plot points in the series. Thank you EPD! A dedicated group of American Civil War history enthusiasts took an hour-long journey through some of the 'history behind the mystery' in Kathleen's seventh and newest Chloe Ellefson novel, A Memory of Muskets, during the March 14th meeting of the Rock County Civil War Roundtable at the Rock County Historical Society in Janesville, Wisconsin. Kathleen's seventh Chloe Ellefson mystery, A Memory of Muskets, is rooted in actual events during the American Civil War, and the modern understanding and reenactment of it. These roots are the subject of Kathleen's illustrated program for the Rock County Wisconsin Civil War Roundtable. It begins at 7 PM, Tuesday, March 14th, at the Janesville Historical Society and is free and open to the public. The lucky winners of Kathleen's American Girl Revolutionary War Mysteries Giveaway are: Dawn Alexander, Alisha Allen, Cheryl Callies, Susan Macdonald, Chera Stories, Chris Swoboda, and Rebecca Vance. Congratulations! Two of Kathleen's American Girl books are set during the American Revolution era, Gunpowder and Tea Cakes and Betrayal at Cross Creek, and she is celebrating them with a giveaway! Seven lucky people will receive a signed and personalized copy of each. Enter before Midnight (Central US time), Wednesday, March 8th by posting a comment on either her Facebook Author page or Sites And Stories blog. Act now! When Kathleen starts creating a new book, she always begins with a new blank notebook. This becomes the repository of all her ideas, questions, research notes, references, etc., about the new story. Based on these, and lots of creative thinking, writing and re-writing (plus a little luck), a finished book will be released some twenty months later. Kathleen leaves tomorrow for a week-long writing retreat at Write On, Door County. While there she'll begin working on Chloe 9 (for release in 2018). She'll also be teaching a writing class for aspiring novelists, Start Your Novel Sure and Strong, on February 25th. American Girl has today re-released its' Felicity Merriman Revolutionary War character! To celebrate her return, the company asked Kathleen to write a new Felicity adventure story—the first about her in six years! To discover 'behind the scenes' details from Kathleen about Gunpowder and Tea Cakes: My Journey With Felicity, click HERE. For ten of the twelve days since it became available for pre-order, Kathleen's next Chloe Ellefson mystery, Mining for Justice, has been ranked in the Top 1% of all US Print Book Sales—out of over 8 million books tracked. Source: Nielsen BookScan. Kathleen's American Girl book, Gunpowder and Tea Cakes: My Journey With Felicity, has begun shipping to readers! This is the first new Felicity book in years (and Kathleen's 20th book for American Girl and her 35th published book overall). It is shipping now from Amazon, Books-A-Million (BAM), and your favorite independent bookstore. Here are the winners of Kathleen's Laura Ingalls Wilder 150th Birthday Gratitude Giveaway: Sherry Byers, Kristen Bonner, Susanne Hantwerker Brown, Debbie Hicks Cantrell, Leslie Carter, Sheila O'Brien Glass, Candy Albright Kennedy, Teresa Mccleave, Amy Tamburro Melino, Jennifer Motl, Wendy Nix, Christine L. Peterson, Alice Reynolds, Cynthia Shores-Dobson, Kathy Snyder, and Kathy Temple. Congratulations! Laura Ingalls Wilder—the revered author of the beloved 'Little House' books about her pioneer childhood—was born 150 years ago today in a log cabin in the 'big woods' near Pepin WI. Laura's stories were some of the earliest that Kathleen read growing up, and influenced her writing career. In gratitude, she is giving away 15 copies of her Laura-related Chloe mystery, Death on the Prarie. Visit her Facebook Author page or Sites & Stories blog to enter. Elise Arsenault is the classically trained actor, singer, and voice-over artist who will be narrating unabridged audiobook versions of the initial three books in Kathleen's award-winning Chloe Ellefson mystery series: Old World Murder, The Heirloom Murders, and The Light Keeper's Legacy. They will be released by Tantor Media in April, May, and June, respectively, and can be pre-ordered now. After reading about Mining for Justice in Kathleen's newsletter, The Larry Meiller Show contacted her yesterday to schedule a live, 45-minute, on-air interview about the book. Larry's popular midday program on Wisconsin Public Radio has a statewide audience of some 100,000 listeners. Kathleen's appearance will be on September 28th. Yesterday Kathleen publicly revealed the cover and story description of Mining for Justice, her eighth Chloe Ellefson adult mystery. Even though trade paperback and ebook copies will not ship until October, pre-orders by eager fans immediately rocketed MFJ into the Top 1% of all US Print Book Sales—out of over 8 million books tracked. Source: Nielsen BookScan. Yesterday Kathleen publicly revealed the story description of Gunpowder and Tea Cakes, which will be her first Felicity, 20th American Girl, and 35th published book. The resulting pre-orders by Felicity fans immediately rocketed GTC into the Top 1% of all US Print Book Sales—out of over 8 million books tracked. Source: Nielsen BookScan. Yesterday Kathleen spent time listening to possible narrators for the upcoming unabridged audiobook versions of the first three Chloe Ellefson mysteries: Old World Murder, The Heirloom Murders, and The Light Keeper's Legacy. They will be recorded and released over the next few months by Tantor Media, a subsidiary of Recorded Books. Details TBA. For three days in a row Kathleen's American Girl Felicity book has been the #1 New Release in the Amazon Children's Colonial American Fiction History category. Kathleen is at an undisclosed location, editing the manuscript of her eighth Chloe Ellefson mystery. The deadline for submitting it to publisher Midnight Ink is January 31st; the book is to be released this fall. Kathleen will be out of communication until late Friday, January 13th. Mr. Ernst will be keeping the home office open until then. 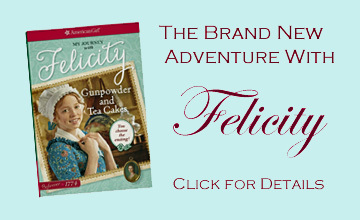 Here is the cover of Kathleen's upcoming American Girl book, Gunpowder and Tea Cakes: My Journey With Felicity. It's her first ever Felicity story, and the first new Felicity book in years! It will also be Kathleen's twentieth for AG and the thirty-fifth published book in her career. Pre-order one now from your favorite local independent bookstore or from a wide variety of national booksellers—including Barnes & Noble, Books-A-Million and Amazon. Kathleen's newest Chloe Ellefson adult mystery, A Memory of Muskets, has now been ranked in the Top 1% of all US Print Book Sales—out of over 8 million books tracked—for a running total of over one hundred days. Source: Nielsen BookScan.